I was surprised to find issues in regard to track compatibility as I started to install track in the Wheeling Freight Terminal staging yard. I was using Walthers/Shinohara track switches and Atlas flex track. All were code 83 rail, but there was something amiss. The National Model Railroad Association (NMRA) has many standards and recommended practices that are used across the model railroad industry so our models can operate using components from different manufacturers. Specific rail, gauge and track switch tolerances are outlined across several standards at the NMRA website. One aspect that is not standardized is the thickness of the ties that support the rails. As I am using up lots of accumulated materials with this project, I’ve encountered a tie thickness discrepancy. Click on the next two images for larger versions. I have accumulated lots of Atlas code 83 flex track as well as several sections of Shinohara code 83 flex track bought at swap meets and train shows over the years. I am using the Walthers/Shinohara track switches on this project and the overall tie and rail height matches the older Shinohara track, but not the Atlas flex track. The height difference is about 0.030 inches. Many people may not worry about a thity-thousandsths of an inch difference, but it is noticable when you push a string of freight cars across an uneven rail joint. Steam locomotives would have some difficulty smoothly operating over the same joint. This situation becomes a problem to solve. I made transition sections of five to six inch long Shinohara track sections by adding styrene shims under the ties. After prepping the rails on each end, the bottom of the ties on the last two inches of these short track sections are sanded to remove the slick, glossy surface. 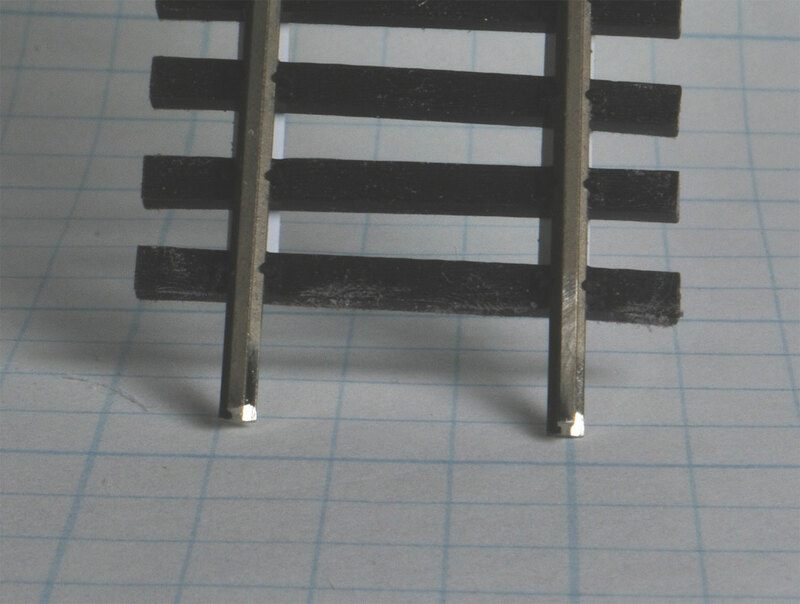 HO scale 2×10 styrene strip shims are cut two inches long and glued onto the ties under the rails. Once the joint is dry, the shims are carefully sanded to make a slight taper. After blowing the dust away, the shims are carefully painted with Rail Brown to hide their presence. I did not have any grey or black styrene on hand for this project. Here’s a transition section before painting. When the transition section is complete, it is soldered to a piece of the Atlas code 83 flex track with the shimmed end close to the rail joint. After the flux is cleaned off of the solder joint, a mill file is used to remove any slight bump at the rail joint. Some people may feel a slight taper can be done by sanding the Atlas flex track ties, but without a belt sander at hand I feel these transition sections do the job. After creating several of these short transition pieces, a friend suggested another method that is much less involved. I’ll cover that in the next post. I welcome your comments here. Comments are reviewed and approved before they appear here. As I began installing track on the Baltimore & Ohio Wheeling Freight Terminal model railroad project, I developed a set of processes to prepare track sections for installation. While working through this project, I felt these processes and tips should be posted so readers can benefit from my experiences. I will be running steam locomotives so extra care and attention needs to be taken when installing track for smooth operation. Rail joints are common places where derailment problems can occur. I carefully prepare each rail joint. I have seen too many modelers rush through this important step and make a sloppy rail joint. Diesels are forgiving of some sloppy track, but not many steam locos. Any rails that will be connected more track will need to have the rail ends prepared using a jewelers file and a mill file. If the rail needs to be cut with a motor tool or rail nippers, then the freshly cut rail ends need to be squared up. The image below illustrates what the rail looks like after being cut with rail nippers. A few passes with a mill file will smooth out a rail end. Click on either of the following images for a much larger size. File the rail bottom lightly to remove any rough edges, then use a jewelers file to add slight tapers to the base of the rail at the end. These tapers ease the installation of a rail joiner. The tapers are the shiny parts at the base of the rail in the image below. This is a completed track section prepped and ready to install. I also run the file lightly over the top end of the rail and along each side to remove any burrs left from cutting or filing. Once the end is prepped, it can be connected to another rail. I do this with whatever rails have been cut as well as rail on new track right from the box. A little extra care at this stage will ensure better operation later. Keep a brass wire brush handy to clean excess metal out the files when you are done. If you solder your rail joints, use a wire brush in a motor tool to clean off any oxidation or dirt. A clean surface will solder easier and you’ll be surprised when you don’t melt any ties! I welcome your comments here. All comments are reviewed and approved before they appear here.